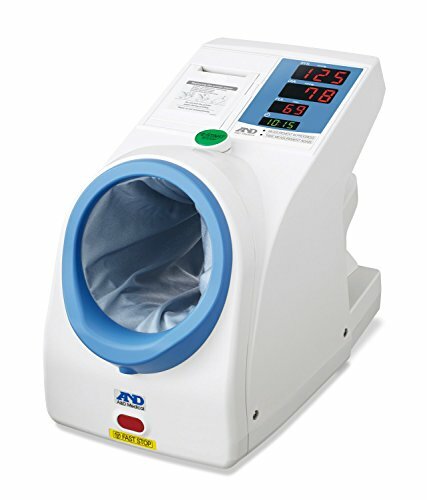 The A&D Medical TM-2657P Automatic Blood Pressure Monitor features a kiosk design that can be on a tabletop or a stand, perfect for use in hospitals and healthcare facilities where multiple users need to get fast, comfortable, and accurate readings, including systolic/diastolic blood pressure, and pulse, all with a date and time stamp on a printout with the facility's name and logo. Ensures accuracy by automatically conforming to the user's arm size, which helps users become more comfortable when taking a measurement - one of the most important factors for accurate blood pressure measurements. The blood pressure cuff is designed to fit most arms (7.1"-13.8"), is latex free, and features a replaceable anti-bacterial cuff cloth to ensure a sanitary solution. Like all of A&D's blood pressure products, the TM-2657P is clinically validated for assurance of the highest level of accuracy. Please contact A&D Medical to learn about available accessories, such as a stand and chair. If you have any questions about this product by A&D Medical, contact us by completing and submitting the form below. If you are looking for a specif part number, please include it with your message.